Lots of devices support Bluetooth these days: Phones, laptops, headphones, speakers, and more. But there are also plenty of audio-emitting legacy devices that don’t, including TVs, stereo receivers, and terrestrial radios. 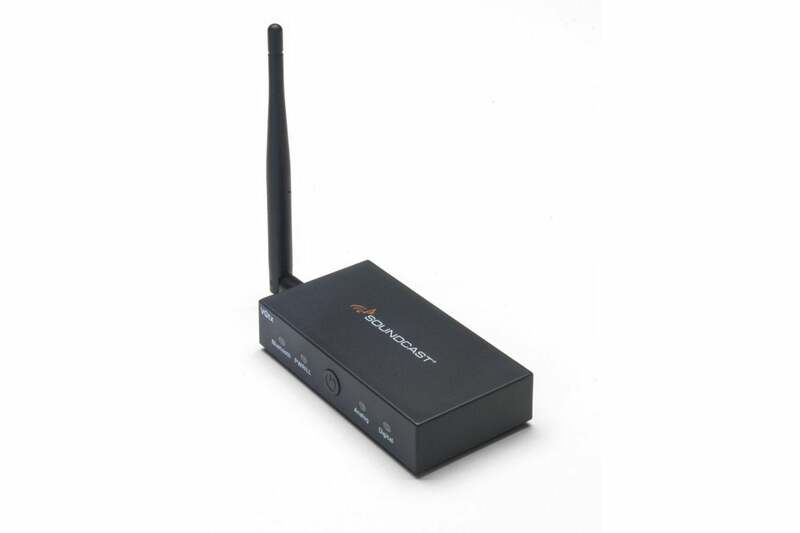 But as long as your favorite legacy device has a headphone jack, it can join short-range wireless-streaming hoedown with an add-on Bluetooth transmitter such as the Soundcast VGtx. 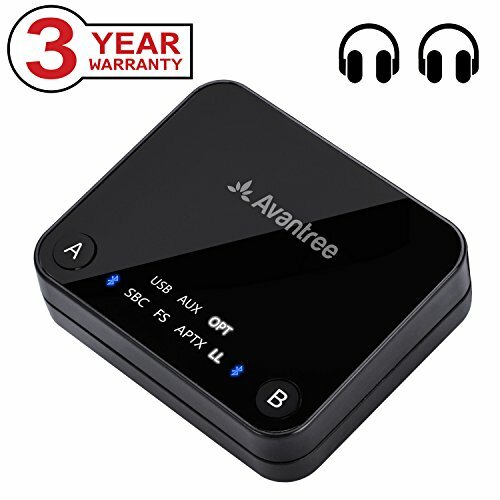 The problem with most Bluetooth transmitters, including the previously reviewed Avantree TC418 ($50 at Amazon), is their relatively short range. If you want to broadcast more than around 30 meters (best case), you’ll need something more powerful—and more expensive. The Soundcast VGtx reviewed here costs twice as much as the Avantree, but it promises up to 50 meters of range. My tests revealed that to be a bit of an overpromise, but the VGtx did outperform the competition. The VGtx is a small gray rectangle about the length and thickness of a deck of cards, but only about two-thirds as deep. The front is given over to the power button, analog/digital mode indicators, a power light, and a Bluetooth status button. On the left side is a threaded coaxial connector for mounting the included antenna. 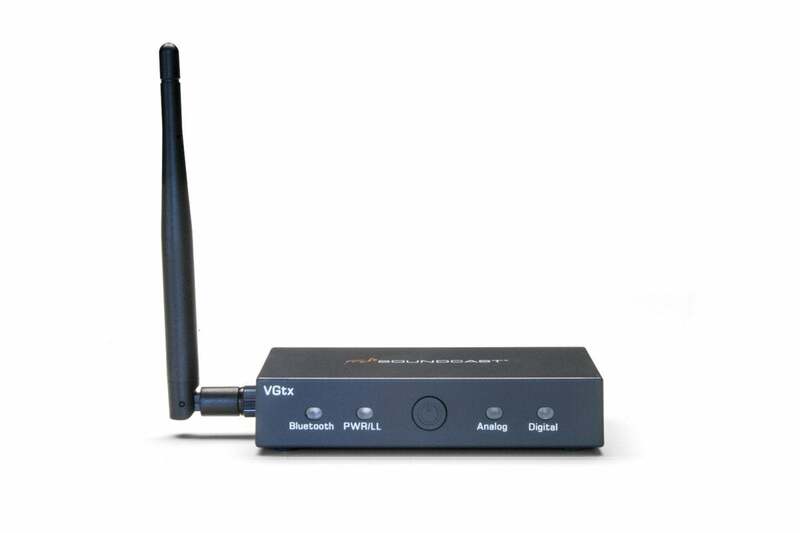 The back is home to a 3.5mm analog input, analog/digital switch, a Micro-USB port for power, and both an optical S/PDIF input and a pass-through output. Here’s the VGtx box and all the parts found inside the box: antenna, cables, etc. The VGtx has four rubber feet, and just enough heft to keep in place wherever you should situate it. Soundcast bundles optical, 3.5mm-to-3.5 mm stereo, and a USB cables (the last being Type A to Micro) for the USB wall wart. That AC adapter uses modular international tips, which weren’t the easiest to put on and take off, but you'll only need to do that once. The USB charging cable tells you that the VGtx can’t function as a USB audio output for your computer, as the Avantree TC418 can. That's a bummer, as it ended up being my favorite use scenario for the Avantree. Of course, you can still use the 3.5 mm analog connection, but USB would mean one less wire when you’re broadcasting from a computer. While the VGtx may not output from USB, the antenna does make for better range. I never saw the 50 meters that Soundcast claims is possible, but I did get around 30. As most of the devices that claim 30 meters give me about 20, 30 feet of real-world performance is an improvement. My shorter range results could also be caused by the Bluetooth speakers I use for testing (JBL); your mileage may vary. Note that this was my best case on the street with clear line of sight. I live in wallboard-and-plaster-over-chicken-wire home, circa 1903, better known as a Faraday cage. Reception in there was not good—10 meters at best. That’s just a warning that you should place as little metal as possible between the VGtx (or any type of radio transmitter) and the receiving device. The VGtx did perform better than the other Bluetooth transmitters we’ve tested, but not by the 20 meters that Soundcast talks about. The VGtx supports Qualcomm’s aptX low-latency codec, which reduces the lag between the broadcast and waves emanating, but even that can seem a bit laggy if you’re watching lips on TV. It’s not earth-shatteringly laggy, but it is noticeable. Unfortunately, the only way to compensate completely for this with any Bluetooth transmitter is to adjust the timing of the audio track—if the playback device allows it. Some computer movie players do, as do Bluetooth-enabled TVs. But if your TV already supports Bluetooth, then you probably don’t need the VGtx (unless your speakers or other audio reproduction equipment is very far from your TV). Note that transmitting device must also support aptX; otherwise, you’ll get the usual 70- to 100 milliseconds or more delay. Lag doesn’t really matter with music, but it can be annoying with video. But aptX sounds pretty darn good. A/B’ing against the digital input, I found it difficult to tell the difference using the average Bluetooth speaker. I really had no complaints about the VGtx’s performance, despite it not meeting the 50-meter promise. It did deliver better range than the Avantree, and the latency was about as low as you can expect. It also looks nice next to your stereo equipment (most transmitters look pretty janky), and it's perfect for broadcasting to a set of Bluetooth speakers. But it doesn’t play audio from your computer, and it handles only a single device. Neither the VGtx nor the Avantree support the higher-resolution aptX HD codec, either, which might be important to audiophiles. Then again, I honestly can’t hear any real difference between the original aptX and aptX HD unless I’m using studio monitors (and I’m not 100-percent sure even then), so I suppose I’m not an audiophile. 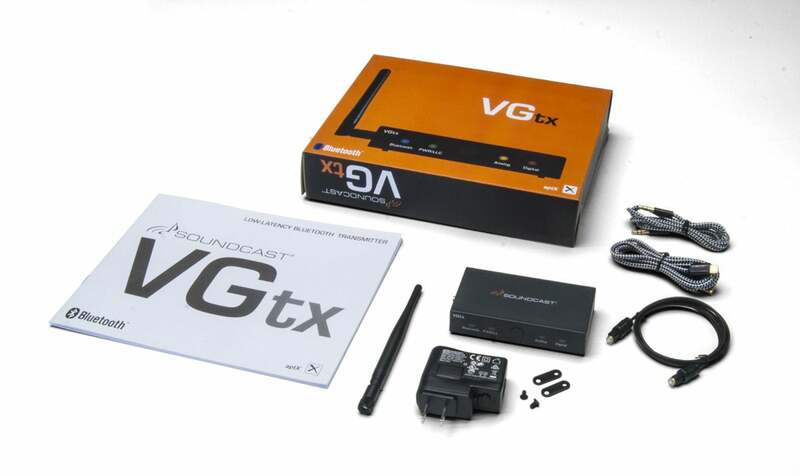 Probably the most salient issue for most people is the VGtx’s price tag: $100 is two to three times the going rate for a good, shorter-range transmitter, and there are dozens that cost even less, although deliver very short range because they're designed for your car and not your living room. This handsome transmitter looks right at home alongside pro audio gear, and has better range (about 10 meters in our testing) than others. It's easy to setup and pair, but it misses a trick by not serving as a USB audio interface, instead just drawing power from USB. Still, if you need those 10 meters, the VGtx gives them to you.